Scott Valley – 2014 is an extraordinary year. We are experiencing an extreme drought and have had a record number of Coho Salmon spawn in our system. Due to drought conditions, the spawning occurred in the main stem of the Scott River, since there was not enough fall and winter runoff for the salmon to reach the systems tributaries. Record low snow pack, ranging from 4% – 12% of average, has resulted in extremely diminished surface flows, which are dropping at a rate never seen before. To further complicate the situation, salmon from other systems spawned in the Scott River, all the way into late March. 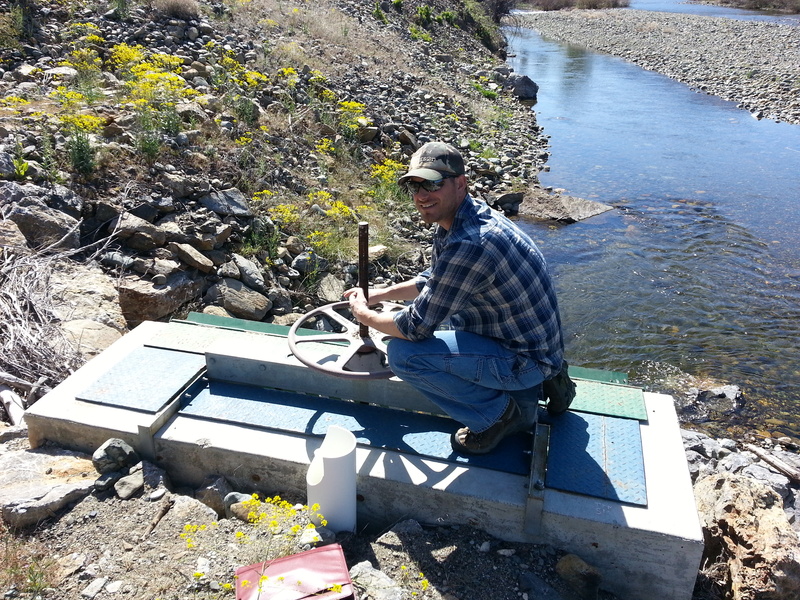 In an effort to try and keep sufficient flows in the main stem, to allow the late spawning eggs to emerge, allow for the 1+ salmon to migrate to the Klamath and the fry to migrate into the tributaries, members of the Farmer’s Ditch Company have put their surface right back in the Scott River to help augment flows. This was a voluntary and collaborative effort between the farmers, the Scott River Water Trust and the California Department of Fish and Wildlife. “We recognize the importance of having as many salmon survive this extraordinary year, not only for our system, but others throughout California, where the salmon were not able to enter due to lack of precipitation and resulting low flows,” said Gareth Plank. The collaboration between the farmers, the Trust and the Department will keep sufficient flows through a critical reach of the Scott River, for a longer period of time, allowing for natural migration and reduce the need for fish trapping and relocation. Additionally, it will keep eggs wet, in reds from the late spring, to hopefully allow for more hatching and live fry. The Scott River had over 3000 coho salmon spawn this year, resulting in a potential of 4 million fry. Well, the House just passed the Senate bill and sent it on to the President. To put this in perspective I put together the following table to help explain what little good has just taken place. Sadly, this is barely a drop in the bucket…and it took how long to arrive at this? You come home from a trip to town to discover that due to a major city sewage malfunction your house has become filled with refuse. What do you do? Raise the ceiling or get rid of the crap and clean the house? Sorry folks, but all of D.C. needs to get a loud and clear message to get serious, start working together and solve this mess. By the way…Happy New Year!! The following is a guest post from a friend and former student at Etna High School, Charles Peckham. Suffice to say that my life and my politics make me the sort of person whom those opposed to genetically modified foods would presume to be playing for their team. And, my concern with Prop. 37 is that the subject of genetically modified foods is misrepresented, not that Prop. 37 is wrong wrong wrong. There is no scientific evidence to support that genetically engineered foods have negative health effects, and admittedly, the sort of evidence that would be necessary to show long-term health effects of food are difficult to obtain. Statistical data is prone to being legitimized by outside factors, and laboratory experiments conducted on animals have limited utility, since the lifespan of most lab animals is different to the lifespan of humans. Furthermore, the field of genetic engineering is relatively new. By contrast, statistical data to support the theory that excessive alcohol consumption leads to long-term health problems is quite solid, because booze has been around forever, so we’ve had sufficient time and sufficient examples. A quick Googling says that genetic engineering has been around since the early 1970’s. That means science has to determine what will happen to people fifty years from now if they use technology that hasn’t even been around for fifty years. It’s not an easy thing to do. Regardless, it’s up to science to determine what the health effects of genetically modified food are. Admittedly, genetic engineering seems like a bad idea. There’s a perhaps inherent fear of tampering with genetic material. Plenty of black and white mad scientist movies have played on this fear, and even as recently as Jurassic Park (1993), frog DNA was combined with Tyrannosaurus DNA, with disastrous results (well, disastrous for the people the T. rex ate, at least). But the goal of science is to reach beyond these inherent presumptions. As Neil deGrasse Tyson puts it, ‘(Humans) are poor data taking devices. That’s why we have such a thing as science, because we have machines that don’t care which side of the bed they woke up (on) in the morning, don’t care what they said to their spouse that day, don’t care whether they had their morning caffeine. They’ll get the data right.’ The same applies for how aesthetically troubling the subject matter is. Science gives us a system by which we can determine how bad something really is, so we needn’t rely on how bad something seems. I’ve already voted, and I admit I voted yes on Prop. 37. If I had to do it again, I’m not sure which way I would go. It’s not because I think genetically modified food is unhealthy, that remains to be shown, and it’s not because I have faith in the corporate food industry to have my best interests in mind. With Prop. 37, it’s a question of information. Prop. 37 is asking for food to inform consumers what’s inside, and I think it’s both responsible and personally preferable to have more information rather than less, even if the information is irrelevant. And, to the best of our knowledge, information about genetic modification is irrelevant to the health of consumers. The only problem is that labeling genetically modified foods is misleading information. It plays into previously mentioned apprehensions about eating food with an otherworldly quality, and this stands to detriment the food industry infrastructure for a silly reason. In effect, the panic over genetically modified foods is (until science shows otherwise) making an issue out of a non-issue. It’s giving people just enough information to confirm their knee-jerk reaction, and doesn’t give them the full picture. The issue is unpleasantly similar to the dihydrogen monoxide hoax, in which propaganda is distributed about a chemical that’s being sold over the counter at your local grocery store named ‘dihydrogen monoxide” (AKA water). The propaganda is full of startling facts about what would happen if, for example, dihydrogen monoxide were to enter one’s lungs, and how dihydrogen monoxide is the primary chemical in acid rain. It’s a good gag. If I hadn’t been told it was a practical joke when I first saw it, I might very well have fallen for it myself. So the real question is, what is the government’s responsibility when there’s a strong movement turning a non-issue into an issue? Part of me says, if the people want labels, let them have labels. Still, to really get to the bottom of this issue, it would behoove both government and anti-genetic engineering activists to come up with sufficient funding to determine any possible health issues. It’s pointless to stir up more panic over the issue before even demonstrating the issue is there. It would be nice if we could have put the horse before the cart on this one. The following is a letter that was written to California Governor, Jerry Brown, from a radical, environmental antagonist who, despite knowing the truth, felt the need to intentionally lie, spread misinformation and attempt to bring unwarranted regulatory hardship upon the agricultural community in the Scott River Watershed. I have long tried to be understanding of opposing points of view. However, the view points were based on honesty and integrity. Mr. Pace’s letter is deliberately dishonest and lacks any aspect of integrity. It is letters such as this that continue to divide communities and cause needless ill will, for the benefit of individual attention…not the benefit of the environment or the community. My corrections to the misinformation are in bold. Your intervention is needed immediately to prevent a tragedy in the Scott River Valley. A large number of Chinook Salmon are in the Scott River waiting to get to their spawning grounds. However, because the Farmers Ditch is running full at an estimated 6-8 cubic feet per second 10 full days after irrigation was supposed to end under the Scott River Adjudication,the Scott River is dewatered and disconnected in the area below the Farmer’s Ditch is diverting the full flow of Scott River. The Farmers Ditch was dry from August 19 through October 23. Prior to the 19th of August, the California Department of Fish and Game asked if we would close our headgate at the fish screen, to hold water in the first 200 yards of our ditch to provide habitat for salmonid fingerlings, due to the mainstem Scott River going sub-surface several yards below our point of diversion. We cooperated and shut our ditch off. Until there is 20+ cfs above our point of diversion, the river will not connect. The water right is for 36 cfs , a full ditch. we reopened our headgate on the afternoon of October 23rd to utilize our livestock water right, as cows are returning from the mountains and need water to drink. What Mr. Pace failed to mention, was that the staff gauge at the headgate, where he trespassed on private property to take several of his pictures, read 6.8 cfs, hardly a “full ditch.” It is now October 30th, five days after opening the headgate, and the water has yet to reach the last two users on the ditch. This is due to it being dry for over three months. We are within our adjudicated right and NO irrigation is taking place. Unless this ditch is turned down or off soon, Chinook salmon will not be able to spawn in the Upper Scott River, the east Fork, the South Fork, Sugar Creek, Wildcat Creek and several other tributaries. Spawning and production fro the largest run in recent history will be lost. The benefit of millions of dollars the state and federal government has spent restoring habitat above the Farmer’s Ditch will be rendered useless and ineffective. This is something you can and should stop. This stretch of the river will connect once we have temperatures below 30 degrees for at least four days, in order to “shut down” the water uptake from our unmanaged forests. This has been the case for the past 50+ years. As stated before, until the trees shut down, or until we receive substantial rainfall, the river will not connect below our point of diversion. This is an area that historically was dredged for gold and the river goes subsurface. Also, Sugar Creek enters the Scott River below the Farmers Ditch. It is not even flowing with enough volume to reach the river. This is natural. Irrigators along the Farmers Ditch are using the pretext of a stock-watering right to continue irrigation far beyond the legal irrigation season. I have pictures showing that some of the fields being irrigated do not even have livestock in them. I also have pictures of the full ditch and the dewatered river below this diversion. I am going to send those to the press this morning along with a copy of this message to you. If you will supply me with an e-mail address that will get noticed, I’ll send those pictures to you too. The two ranches, of the ten that have a water right on the Farmers Ditch, that have green grass, began pumping water from below the ditch, up the hill to irrigate. The other eight are dry and have no forage. Mr. Pace is aware of this ability and is deliberately lying…despicable. In fact, it is was because of the lack of ditch water that the two ranches installed pipe from below the ditch in order to deliver water to fields for irrigation when the ditch ran dry. Mr. Pace was fully aware of both of these projects occurring, the first over five years ago. For years I and others have been asking your Department of Water Resources, your Department of Fish & Game and the State Water Resources Control Board which you appoint to address this abusive and intentional lawbreaking. A few years ago, I presented a PowerPoint to the SWRCB which showed illegal, out of season irrigation being done from this very ditch. Once again, Mr. Pace’s allegations are fallacious and lack truth and basis….period. The water right holders on the Farmers Ditch have not irrigated past October 15th. In fact, there have only been two years out of the past twelve that we have actually had enough water in the ditch to irrigate later than September 10th. A few years ago this ditch was turned on in the Spring in a manner that dewatered the Scott River below the diversion. Several hundred thousand Salmon and Steelhead died as a result, including listed Coho Salmon. While state officials knew about this and referred the ditch manager to the DA, only a slap on the wrist resulted and the matter was not reported to or by the press. In this way, state officials and the DA countenanced lawbreaking and thereby encouraged that lawbreaking – and the dewatering of the river – to continue. The Farmers Ditch has a year-round water right and has always cooperated with the CDFG to benefit salmonids. Once again, Mr. Pace is intentionally lying….period. There have been several years when our ditch has cooperated with the CDFG to maintain habitat in our ditch for salmon, to prevent loss. The alleged accusation by Mr. Pace is far-fetched at best. No communication from any state agency was ever received regarding any such instance. The one occasion that we are aware of, when a couple of salmon were stranded and died, occurred when the CDFG failed to trap survivors when the river was drying up, due to a holiday. It was because of the “holiday” that the biologists did not trap the fish and in that time period the river went subsurface and the fish died. In spite of numerous attempts over the past ten years to get responsible officials to do their sworn duties in order to stop the illegal irrigation and illegal use of this ditch in violation of several Water and Fish & Game Codes, these officials have done nothing.That is why I am contacting you in hopes that you will take action to help the Scott River Salmon and all the other water users who suffer bad publicity because of the illegal actions of this one irrigation district or private group of irrigators, i.e. 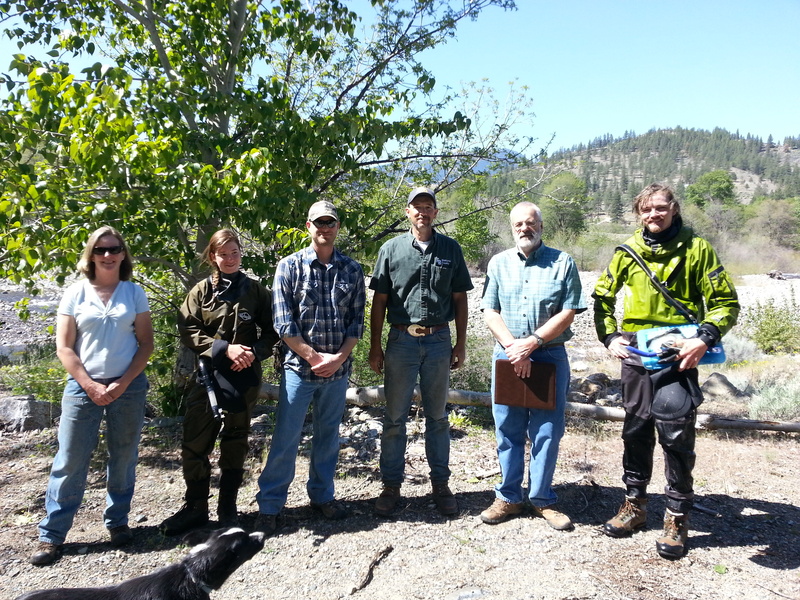 those who control the Farmers Ditch in the Scott River Basin. Ironically, due to the voluntary efforts of the local natural resource stewards, despite the antagonists best efforts, we are having a record run of salmon this year. I for one am very excited that we have the returns that we are seeing…I think it is a great thing…and shows that salmon are resilient, follow ocean conditions and the existing habitat conditions allowed for excellent escapement. We do not need more interference from so called “environmentalists” nor regulation from state and federal agencies. We do need to accept and allow mother nature to run her course. Please, please take action quick for the Salmon and the People. In conclusion, no “illegal irrigation” is or has taken place. The Scott River is snow-fed. Currently, with the lack of management in our forests, due to the efforts of Mr. Pace and the organizations he represents and works with, we will continue to see lower flows, even in average water years. Plain and simple, our evapotranspiration rates are out of balance and we are well beyond optimum tree density. The farmers and ranchers in the Scott River Watershed have been very proactive in habitat enhancement and voluntarily providing water and habitat for the benefit of salmonids. Mr. Pace and the others who continue to slander the efforts of the true natural resource stewards only seek to divide communities and in the end, harm that which they claim to be “fighting” for. Proposition 37 is plain and simply a bad law….for multiple reasons. Prop 37 would require labeling for non-harmful ingredients. Prop 37 does not require ALL products to labeled. Prop 37 is a California-only regulation on food. Prop 37 provides loopholes for imports to evade the labeling requirement. Prop 37 would increase food costs in California by over $400 per year. Prop 37 would create additional bureaucracy and cost tax payers millions. Prop 37 would open the door to frivolous lawsuits. Any proposed regulation, that will have such overreaching impact, should go through legislative and economic analysis, not through the proposition venue. I fully support the consumer’s right to know if anything harmful is in a product that they might buy. If a product is harmful, it should be labeled, but directed from the FDA, not the state. Labels informing consumers of the ingredients should be voluntary. There is already an organic label to identify non-GE products. If there is strong support to identify ingredients in non-organic foods, I would encourage someone to take advantage and create a niche label. It would seem to me, to be a wonderful opportunity. 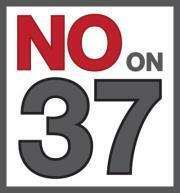 I support a NO vote on Proposition 37. 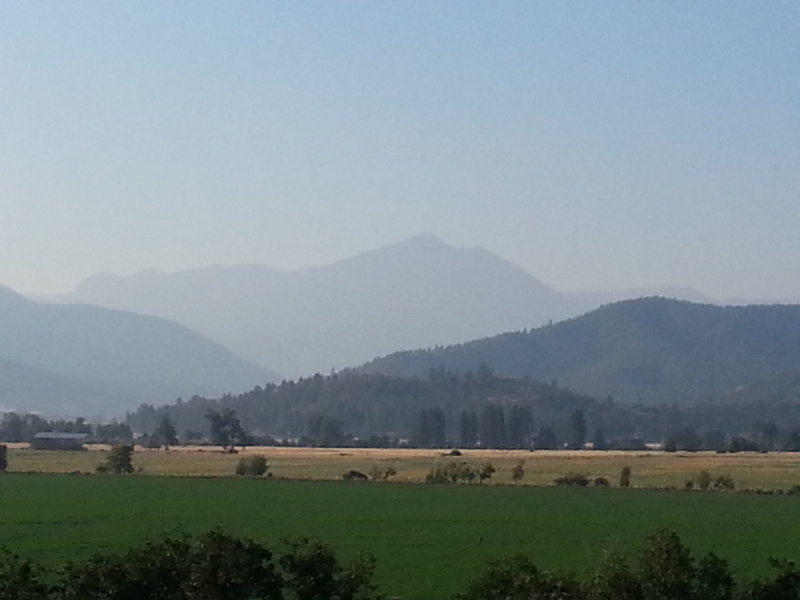 Smoke rolling in over the Trinity Alps. Most folks have noticed, it is fire season in California and most of the western United States. What many may not know is that the ‘brilliant’ state of California has also begun to send out ‘fire suppression’ bills to the rural residents of the state to raise an estimated $84 million to help fund Cal Fire, the agency responsible for battling wildfires. This new tax has been levied on only the rural residents, without a 2/3 vote, simply because they live in the areas where fire is most prevalent and because the state budget was $10 billion in the red, the general fund is empty and the Cal Fire budget has more than doubled over the past 10 years. I’m sorry folks, but this new tax is wrong, unfair and should serve as a major wake-up call to all residents of the state. First, most of the western forests are now more than 300% overstocked due to the general public’s support of stopping logging and preventing healthy forest management which has resulted in excessive fuel loads and diseased forests ripe for devastating fire. Second, most of the long-term rural residents of the state have done extensive fire-proofing on their property. Third, public officials have done little to curb development in forested areas, let alone plan for fire events. Fourth, many rural Californians already pay a local fire fee to support local fire districts and fifth, this new tax will discourage rural residents from passing future bond measures and initiatives to support local needs. This tax needs to be withdrawn, period. Forests on public lands are a public resource and their management should be paid for by the public. It is long past time for active management to return to all western forests. There are jobs to be created, revenue to be generated for local schools and communities and money to be saved from fighting fewer fires, which would be less devastating if management were allowed. Forests are a renewable resource…and more quickly renewed through active management practices than as a result of recovery from a fire, which often times devastates the soil. It is time to return commonsense to the way we manage our forests and run our government. Just saying…. Yesterday, while the Verizon towers were down in Siskiyou County, a newsletter from within the USDA, Greening Headquarters Update, was released and had a suggestion to implement the Meatless Monday Initiative within the agency. There was a quick uprising among many in the agricultural community, within the social media world. By 1:07 in the afternoon, the USDA retracted the statement in the newsletter as released in The New York Times. Now, most folks would think “Excellent, we accomplished our objective,” and move on. However, this is not the case with some, as I continue to see several rant on and now I understand several industry organizations are considering a ‘unified response’ to the matter…yes…after it has been retracted and the USDA’s position clarified. To those who are still ‘worked up’ over this, I respectfully ask you to stop for a minute and take a deep breath. Allow the emotions to settle down and let’s take an objective look at what further actions, if any should be taken. First, I am a beef producer and admittedly was not a big fan of the Meatless Monday Initiative. However, after taking some time to look at things objectively, I completely support the idea of encouraging folks to eat more fruits and vegetables, most do not eat enough. We should all be supportive of people eating better balanced meals that include all the food groups. Second, let’s take a look in the mirror. What does it look like to our customers when agriculture is constantly ‘on the fight,’ ‘whining,’ and complaining on a daily basis? Folks, certainly we face challenges, but think about all we have to be thankful for. We should spend some more time showing gratitude for positives. Third, I agree with a dear and respected friend who said, “I just don’t think people in Ag stop to think for a minute how bad they look every time I see the hunk of meat Monday’s, etc. it’s just as adversarial to me as the anti-meat campaigns.” We should be celebrating that people are now posting and sharing recipes of all kinds through a plethora of blogs and social media platforms. What could be better than more people taking the time to return to the kitchen and actual start cooking again? Think about it. If they start cooking vegetable dishes, they will most certainly expand to include meat. This is a positive, not a negative, in my humble opinion. Fourth, to those considering continuing to beat the proverbial ‘dead horse,’ I offer the following suggestion. Be gracious to the USDA for retracting the statement and clarify their position. Recognize that the USDA does not just represent the 2% of the country that produces food, but also 100% of the customers. Politely share the current information that refutes the UN study and close with a smile and a thank you. In my humble opinion, this continued negativity, does not promote healthy relationships with customers and will only serve to hinder the efforts of the USFRA and other organizations that are working so diligently and sincerely to encourage dialogue. Celebrate. Be thankful. Be Happy. Stay positive. ** After receiving a number of messages from those in the ‘Hunk of Meat Monday’ crowd, I want to be clear about a couple of things. First, I support your endeavor and believe it has been very successful and informative. Second, hindsight is always 20/20, consider this….what if ‘Hunk of Meat Monday’ had been ‘Satisfying Steak Saturday,’ or ‘Fabulous Meat Friday.’ Rather than coming across to some as being ‘combative’ or ‘un-supportive’ of the idea of eating more fruits and vegetables, it may have been even more successful, promoting higher quality protein later in the week. What if ‘Hunk of Meat’ Monday had been first and ‘Meatless Monday’ had been launched after? Would we have considered that to be combative? Finally, while the premise behind ‘Meatless Monday’ in regards to health and the environment is ‘off base,’ in my humble opinion, the objective of getting people to eat more fruits and vegetables and think balance in diets is one that I do support. Please, realize that I am not trying to promote any single way of doing things…merely offering suggestions to think about and perhaps help shape a more positive effort on another issue in the future. Keep up the great work!